Beans are an ideal place to start seed saving as for the most part they are very easy. Most beans are from this species (P. vulgaris) and includes almost all climbing (pole) beans and dwarf (bush) beans. 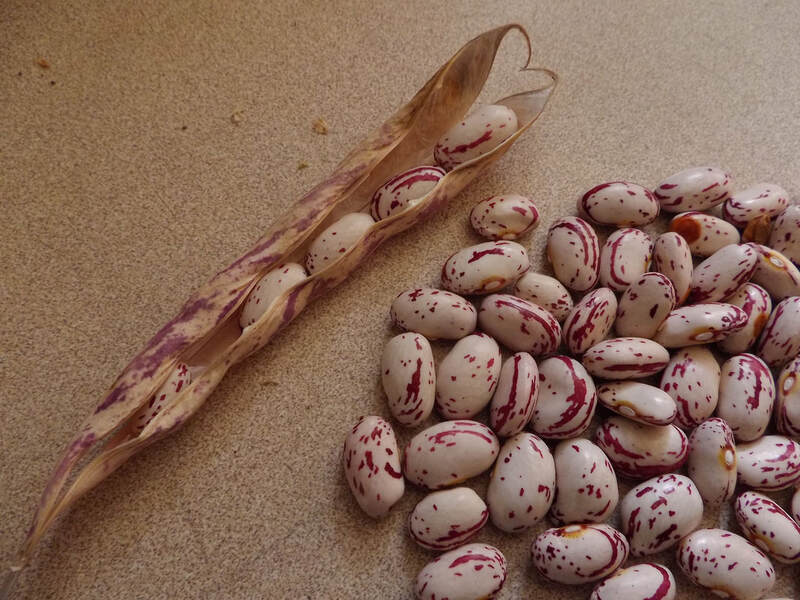 There are a few other bean species to watch out for including lima beans, snake beans, broad beans and runner beans, for these see our separate seed saving tutorial. Beans can be grown from spring right through to late autumn in Nelson although for seed saving it is best to plan around summer seed collection. Climbing beans, also known as pole beans, are generally more productive but require a support structure to grow up, most only reach 1.5-2.5m but some may grow to over 4m in good conditions. Dwarf beans, also known as bush beans, are generally less productive and only grow to about 0.4m so do not normally need any support. The other main differentiation is that climbers are generally indeterminate and will produce flowers over a longer period of time, if you keep picking the young pods the plant will keep trying to produce more. Dwarf beans on the other hand are determinate and tend to produce all their flowers at once so successive sowing of dwarf beans are needed to extend the harvest period. Seeds should preferably be planted direct where they are to be grown as they dislike being transplanted and sown at a depth equal to about twice their size. Young seedlings are prone to slugs and snails and can sometimes be lost to birds or cutworms. As the plants grow any that are off type or weak should be removed to improve the seed line. Cross pollination can occur when beans are planted in close proximity to one another and if possible another crop should be grown between varieties. Isolation barriers/cages can be used but are generally not necessary, time isolation is also useful. Being self pollinated beans do not require insect pollination to produce seeds. To collect bean seeds the pods are left on the plant to fully develop and dry. This often stops further production of indeterminate beans (climbers) so setting aside some plants that are left to go to seed while continuing to harvest off the rest is a useful strategy. When dry the pods will turn brown and brittle and can be collected. The beans can be removed, for household seed saving this can normally be done by hand. The seeds are then dried further until they resist denting when squeezed with a fingernail. Seeds can be cleaned and sorted, keeping the highest quality ones for seed and sending the rest to the pot for eating. If there are small holes or an insect infestation in your beans then once they are really dry they can be placed in a sealed container in your freezer for three days to kill any eggs/insects present, if you do this please note it on the seed return form when you drop them off to the seed library.